When Franco left, we assumed that the Finkster was going to be close behind. But, now Rudy made Fink the Acting Chair, so it looks like he's here to stay. Now, we still get letters and email asking about the victim's of Finkel's friend. And we must confess that it is almost not worth answering any questions about them, as nothing seems to have changed. "But now, our suicidal leaders on the NYCHA Board have gone and done it again. They've decided to kick the victims. Four of the women who had complained of being sexually harassed by Gatewood were all called in to their various supervisor's office this past Friday. Alberta Fuentes, Director of Staff Development, was summarily fired. The other three, Bat-Sheva Horodniceanu, Sonia Guidry and Maristella Kelsey were all told that their salaries were being reduced. At least one of the women was supposedly transferred to NYCHA's Siberia--Bush Terminal. This follows the past Spring's demotion of Shirley Brown, who had also complained of Bruce's unwanted intentions." As of the publishing date of this issue we're told that there have been no changes in the status of these victims. Now, it shouldn't really matter why Franco's gone, nor why Finkel's still here. What matters is that the victims are still being ignored. That gives the wrong signal to women who fear reporting on assaults by their bosses. What say you, Mr. Mayor? Cancel Our Missing Person Alert! Hey! Ms. Castenada has resurfaced. (Sorry. I just realized that sounds as if we were speaking about some highway!) She's back at work for NYCHA. 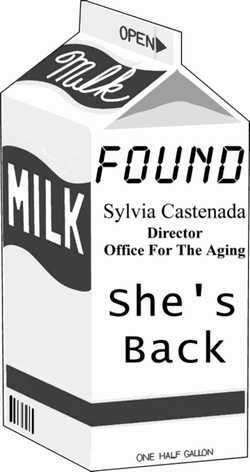 Deputy Mayor Ninfa Segarra took some heat for allowing HUD funds to pay for using Sylvia in a non-Housing Authority capacity. So, as of last week, Sylvia is back to supervising the standard of care(?) for our Seniors. We're getting very close to having our Internet-Only Issue of the Spotlight on Corruption posted on our web page. We believe that it will be, by far, the most important Issue we have done. But first, a caveat! There are those who question whether releasing important evidence won't compromise the rumored DOI Investigation. Again, I want to remind those folks that for over two years DOI knows that there is testimony that links a multi-million dollar contractor with a New York City Housing Authority executive. DOI has refused to receive that testimony. In fact, in order to keep this story from going public, they agreed to contact the person who can supply that information. I have a tape of them being told of that information. Yet, to this day, they have refused to listen to that story. Of course, if there is any other investigative agency interested in this case, please email us at the address below. We would gladly hold off on posting any evidence, if a real investigation was commencing. And we would gladly supply any honest investigative agency with the same proof offered to DOI. However, lacking the beginning of a real investigation, we will publish within 10 days. It is written by Peter Benjaminson, who was the Executive Assistant to the Commissioner of DOI. It is published by Barricade Books and I know that it is carried in some branches of the NY Public Library. We recommend reading the entire book, which is a quick read at only 249 pages. However, if you're pressed for time, we'd ask that you read Chapter 26, DOI as Lap Dog. It runs from pages 170 through page 181, and it will truly open your eyes as to what has happened at this supposed investigative agency since the Giuliani administration took it over.